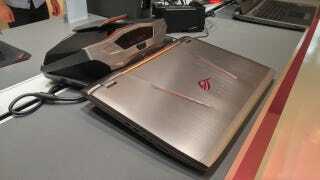 If the Philips AmbiLux TV stole my heart with its audacious projected immersive lighting tech, the batshit-crazy ASUS ROG GX700 water-cooled gaming laptop has had the same effect for me but in a laptop. This thing is an absolute beast. Let me reiterate that top-line spec–this is a water-cooled gaming laptop. A world-first by ASUS—in an actual product, that is—the ROG GX700 comes complete with a hefty, clamp-on water cooler that snaps onto the back of the 17-inch laptop via a custom connection. Pushing down on a chunky button releases the laptop from the base cooler unit, while a levered arm makes sure the two components stay together once reconnected. As such, the water cooling unit is really an accessory of sorts–there for when you’re really pushing the laptop to its limits at home on your desktop, and left to one side when you’re travelling. It looks like ASUS is taking full advantage of the overclocking capabilities that the water cooler affords it. Equipped with a supremely overclockable 6th-generation Intel i7-6820HK 2.7GHz processor, 64GB RAM and the latest GTX 990M GPU, German site Computerbase lists the dedicated graphics capabilities as making use of 2048 CUDA cores with a core clock speed of 1190MHz, packing 8GB of video RAM for an effective 5000MHz on a 256-bit bus providing 160GB/s bandwidth. That’s an easy rival for even some top-end dedicated desktop rigs. The ingenuity of the cooling unit means that, once connected, the cooling process kicks in instantly and, tied to an overclocking script, within seconds you’re squeezing as much as an 80 percent performance boost from the laptop. The industrial-looking cooling hump is certainly eye-catching if not necessarily eye-pleasing, but the build quality of the laptop itself is top notch. Not massively heavy, at least in comparison to other gaming laptops, it’s a metal build using titanium and copper accents. It looks great, in a mean “I’m gonna frag your face” kind of way. HDMI, USB 3.0, Thunderbolt, DisplayPort and brand-spanking-new USB-C ports are all on offer. A well-spaced keyboard has a comfortable amount of travel to each key press, and a bright 4K IPS display with decent viewing angles finishes everything off, pixel-packed to really make the most of the graphical processing grunt on offer. Heading to shops in Q4 of this year, there’s no pricing available yet, but expect to pay quite a bit. It’s as extravagant as gaming hardware gets, so if you’ve got the cash, it’ll more than compensate for any appalling Counter-Strike kill/death ratio you’re lumbered with.